Through its venture class contracts, NASA has purchased one flight each from Rocket Lab USA of Huntington Beach, California, and Virgin Orbit of Long Beach, California. Each mission for NASA is expected to carry approximately a dozen CubeSats. If the missions are successful, NASA will look at options for buying additional flights. NASA is using small satellites, including CubeSats, to advance exploration, demonstrate emerging technologies, and conduct scientific research and educational investigations. Venture class launches will provide NASA the ability to launch on the small satellite’s schedule and to a specific orbit where they can best accomplish their mission or perform their research. The cube-shaped satellites being manifested as part of these two venture class demonstration launches are approximately four inches long, have a volume of about one quart and weigh about 3 pounds. The standard dimension of a CubeSat is 1 unit or 1U, which is equal to 10x10x10 cm, and CubeSats can be up to 6U in total size. The CubeSats on NASA’s venture class missions are 3U and 6U in size, providing more room for science and instruments. Rocket Lab is preparing to launch the first venture class mission for NASA this summer. The company just completed processing the CubeSats for flight on the Electron rocket at its Huntington Beach facility. The company’s launch pad, Launch Complex 1, is located on the southern tip of the Mahia Peninsula in New Zealand. Virgin Orbit is also making progress on its own expendable rocket. Rather than launch from the ground, the company’s LauncherOne will be carried to a high altitude by a carrier aircraft before the rocket separates and carries its payloads into low-Earth orbit. 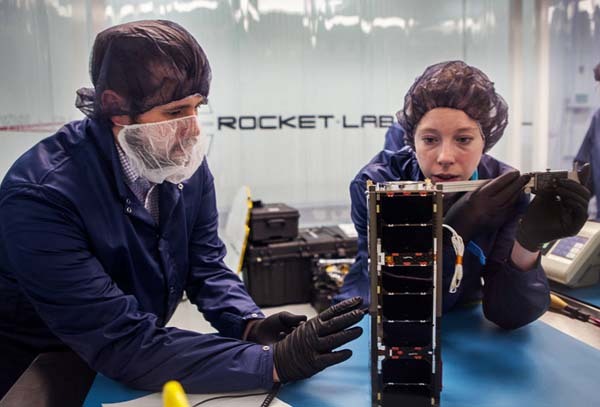 Ten CubeSats on the Rocket Lab flight are launching as the 19th Educational Launch of NanoSatellites or ELaNa mission through NASA’s CubeSat Launch Initiative. NASA has selected more than 150 CubeSats through this initiative from 39 states. In March, the agency announced 11 CubeSats it selected to launch and reprioritized another 10 missions to begin launching in 2019. The commercial launches will be licensed by the Federal Aviation Administration. While NASA is supporting emerging launch providers in this field, the venture class contract is a very hands-off approach from NASA’s usual role, added Norman. The agency’s Launch Services Program team made their technical feedback and systems engineering practices available to both companies, but NASA has chosen a “light touch” with these two emerging companies. “This light touch allows NASA to contribute to this field without impacting how these new rocket companies want to do business,” said Norman. The Earth Science Division of NASA’s Science Mission Directorate in Washington has partnered with launch services to fund the venture class contracts. NASA will continue to offer CubeSats an opportunity to hitch a ride on primary missions in order to provide CubeSats opportunities to accomplish their mission objectives. For example, the agency is planning to launch 13 small satellites as secondary payloads on Exploration Mission-1, NASA’s first integrated flight of the Space Launch System and Orion spacecraft, which will take CubeSats deeper into space than ever before.